The goal of the design competition was to expand the reach and highlight the role of three community gardens in Boston. Mayor Martin J. Walsh yesterday announced the winners of the City's third Public Space Invitational, a civic design competition that seeks ideas that reimagine and enhance Boston's public spaces. The announcement was made as part of an event at the Nightingale Community Garden, one of the locations selected. 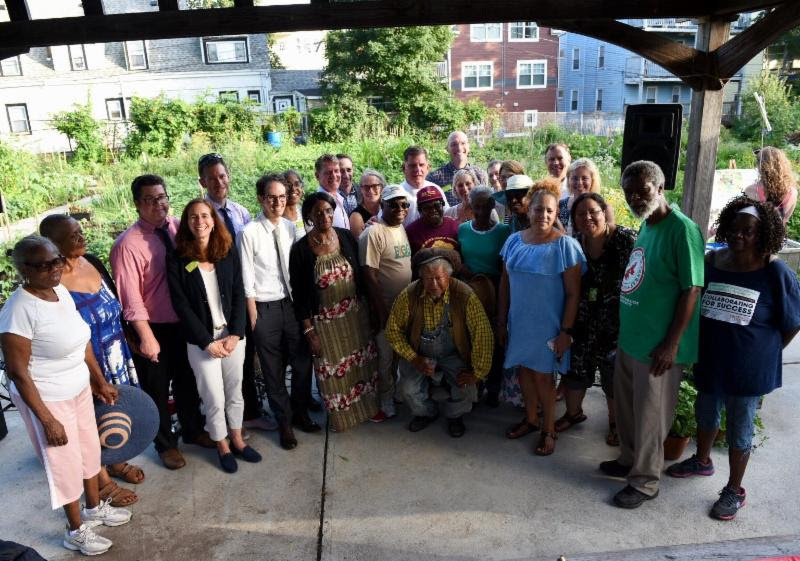 This year, the Mayor's Office of New Urban Mechanics and The Trustees called for innovative design installations at three community gardens: Nightingale Community Garden in Dorchester, Chilcott & Granada Community Garden in Jamaica Plain, and the Fenway Victory Gardens. The three winning projects will bolster the connection between neighborhoods and community gardens and will support community conversations and storytelling, community dinners, and theatrical performances. "Over the years the Public Space Invitational has inspired amazing projects that highlight the creativity of our residents and makes our publics spaces shine bright," said Mayor Walsh. "I am excited to congratulate the winners of this years contest and be able to highlight the importance of our community gardens as these projects take shape." This year's design competition is part of a three-year partnership, called Community Grown, between The Mayor's Office of New Urban Mechanics, the City of Boston's Department of Neighborhood Development, The Trustees, and TD Bank to expand the reach and highlight the role of community gardens in Boston's neighborhoods. In addition to community-driven design projects, the program will feature a series of community-building events and skill-building workshops planned for up to 40 gardens in six of Boston's neighborhoods. With a goal to spark creativity and community growth, Trailer Made is a solar-powered, towable, modular community gathering space that relies on locally sourced and recycled materials. The structure, once unpacked, will feature an events space with tables and chairs, interactive 'planter' sculptures, educational panels with chalkboards, electricity and lighting for events, and a phone charging station. 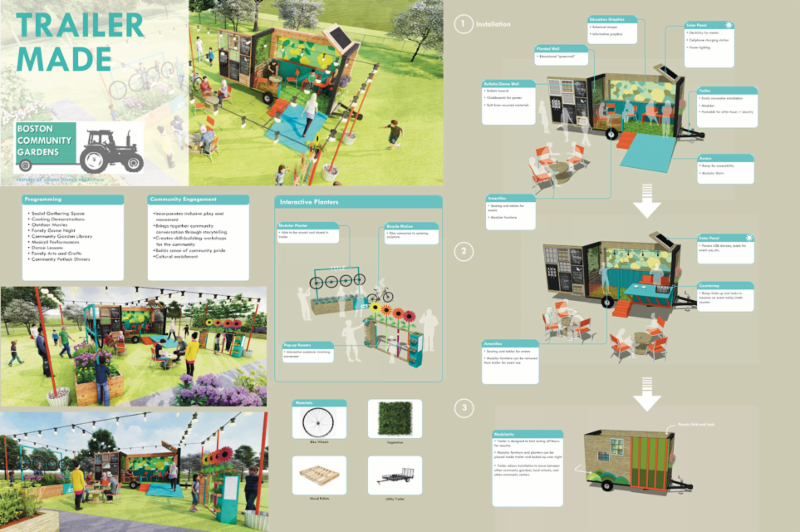 Created by landscape architects Andrea Fossa and Robert Barella, Trailer Made will travel between the Fenway Victory Gardens and Chilcott & Granada Community Garden in Jamaica Plain. 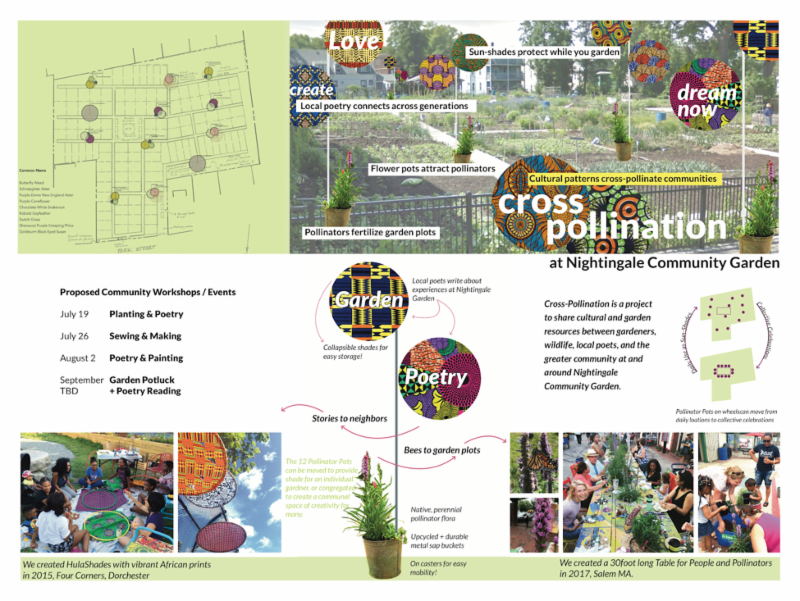 Cross Pollination is a project at the Nightingale Community Garden that aims to share cultural and garden resources between gardeners, wildlife, local poets, and Boston's residents. Cross Pollination is the creation of Claudia Paraschiv, a registered architect, community artist, educator, Annie Scott, an ecological landscape designer, community organizer, and Azia Carle, a fine artist, community artist, and community organizer. Together with the garden and local community, the artists will create pollinator-pots planted with native pollinator-friendly flowers to attract bees and butterflies that will benefit the nearby gardens with greater fertilization and crop productivity. 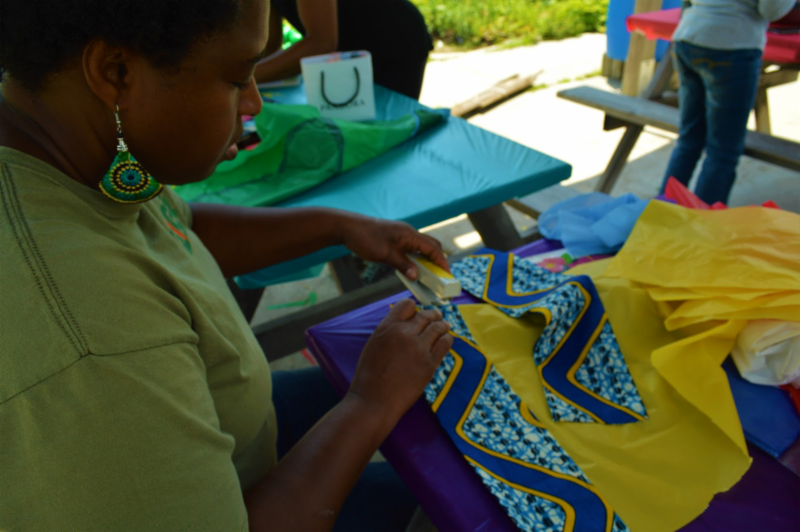 The pollinator-pots will also be "planted" with locally-crafted, African print fabrics to create "shade-flowers" to provide needed shade for gardeners, while also attracting residents walking by with their bright colors and poetic messages. Program participants will get to help create the installation, with planting and shade-flower making among the planned events. Through interactive theatre performances and the creation of banners based on national flags, Celebrate & Activate will honor the cultural, linguistic, and agricultural diversity of Nightingale Community Garden, which features gardeners from more than a dozen countries. Melissa Nussbaum-Freeman, Nightingale gardener and Director of Red Sage Stories, is leading the project with Ayako Maruyama, Creativity Lab Design Lead at ds4si. The project also utilizes the compost area of the garden through interactive storytelling, colorful art installations, activities for children, and sharing food at four garden-cycle themed events. Artist-led programs will include interactive storytelling events on the themes of sowing, weeding, harvesting, and composting. TD Bank is the presenting sponsor of the Boston Community Gardens partnership, granting a total of $225,000 over three years. The Public Space Invitational started in 2014 with the aim of making Boston's public spaces more delightful, welcoming, and intuitive. It has resulted in a wide-variety of projects, including a portable reading room for neighborhoods and green spaces, a tidal vibraphone on the Congress Street bridge, the activation of the mezzanine of Boston City Hall with brightly colored skateboard tape, a poem/photography series from Boston's Poet Laureate at the Mattapan Branch Library, and a project that completely reimagines street furniture. Grassroots, a program of the City's Department of Neighborhood Development (DND), promotes access to urban green space through the conveyance of city-owned land to non-profit organizations, and the provision of competitive grant funding of up to $150,000 for garden design and construction. TD Bank is committed to driving positive change that enriches the lives of our customers, colleagues and communities. In support of our mission, TD recently launched The Ready Commitment, which is targeting $1 billion by 2030 toward community giving, in order to maximize our impact in supporting financial security, elevating the quality of our environment, creating opportunities for everyone to participate in their communities, and supporting more equitable health outcomes for all. You can learn more about the Ready Commitment online.